Happy Wednesday everyone! I'm excited to share with you my 3rd video blog for the Girl Behind the Blog link-up! This month I'm sharing with you about something God has put on my heart to accomplish, as well as a change that is coming to my blog. I'm excited to let you in on what God is challenging me with. Thanks for listening! If you want to link up and share your video blog, click the adorable picture below. Thanks 5ohWifey and Trial By Sapphire for hosting this month's Girl Behind the Blog link-up! We can always use more people with the gift and passion for encouragement in this world! Too often we only hear discouraging things from the world and the popular media. It's so great to "meet" you Mackenzie! Thank you for linking up with Ash and me. The more I read mommy blogs, the more I realize exactly what a humbling experience parenthood is. How beautiful that you're confident enough to admit that you're constantly learning and yet you're completely willing to help others and discuss things. I love that you included a very explicit offer to help others at the end of your vlog. You are wonderful, Mackenzie! Enjoy your day! And thank you again! I don't quite know why, but your blog brought tears to my eyes. I can just see your genuine love for Jesus through your words and that is so, so, so encouraging! I really respect your decision to take a break from advertising. Thanks for sharing. I LOVE this link up. I'll be posting mine later today. You spoke straight to my heart. I felt the same way after my first was born, unsure of my place in the world. I've settled into my mom role comfortable 4 years later and its opened up amazing ways to minister to others. I can't wait to read about what God had planned for you. Thanks for the encouragement you provided me today! This blog sums up why I love you! You definitely have pinned what you're great at - encouraging others! 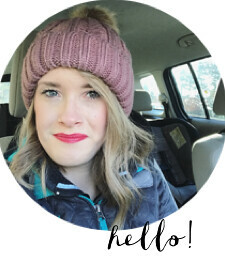 And I also really appreciate what you said about your advertising - I haven't started doing anything aside from free swaps on my blog, but overall, I've been really worried about how much time blogging takes - the constant networking, social media, etc. - I feel like I should be spending more time with Benjamin and doing family things, but I also love doing blogging stuff. The whole thing has been a real struggle to find the best time management balance, and I still haven't figured it out yet. So it's nice to know that's something others struggle with too - and very impressive that you recognized you needed a change and you're brave enough to make the change! Anyway, your vlog has given me a lot to think about, and your words are helpful to me right at this moment as I figure this all out. I feel like I spend all day on my computer, and still don't accomplish nearly all I want to accomplish for blogging, and I'm missing out on family time. I know life isn't about the number of blog followers I have, but it's easy to get sucked into the addictive nature of it all. Maybe I do need to focus more on being true to why I started blogging, and focus more on time with my family - the relentless posting, promoting, linking, social medializing - perhaps if I am struggling with that this much, it's a sign for change. LOVE this, so excited to see how everything unfolds for you. So eloquent and insightful! What a heart for Jesus! Encouragement is most definitely one of your spiritual gift! and you do a great job of allowing the Lord to work through you in encouraging others. I love how sensitive and obedient you are to the Lord's prompting. loved this vlog and loved hearing your heart! I just found your blog because of this and was really touched. I love that you were able to recognize a specific gift of yours and use it! Such a beautiful goal! Your heart for encouraging other women and influencing them for the Lord is definitely an inspiration. I'm also going to Influence and am excited to see how the Lord will speak to us there. thanks so much for sharing! i so wish i could go to the influence conference just not good timing right now.